Leading Manufacturer of tanker ladder from Secunderabad. Tanker Ladders are light aluminium ladders used for maintenance, repairs, re-fuelling and cleaning of tankers which are used in the petrochemical, chemical and food industries. Besides this, they can also be used to work safely on any high vehicle roof such as trucks and buses. 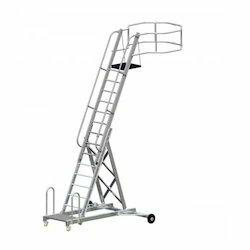 The tanker ladder is adjustable by means of hand winch, the side support section and a double-sided handrail making it easy to work at different heights. All our tanker ladders are mobile with wheels for easy movement. For maintenance, repairs, re-fuelling or cleaning tankers and tank wagons. Tanker ladders consists of a 2-section push-up ladder (max. load 150 kg) which is height-adjustable with a side support section and a double-sided handrail. 2-section ladder extended with height adjustment by means of pulley/hand winch, with support section and handrail both sides. Should the existing modular system not fulfil your requirements, we can also design and manufacture special solutions on request. Looking for Tanker Ladders ?